We have established a method for the purification of coregulatory interaction proteins using the LC-MS/MS system. Tsuchiya, M., Karim, M. R., Matsumoto, T., Ogawa, H., Taniguchi, H. A Protein Preparation Method for the High-throughput Identification of Proteins Interacting with a Nuclear Cofactor Using LC-MS/MS Analysis. J. Vis. Exp. (119), e55077, doi:10.3791/55077 (2017). Transcriptional coregulators are vital to the efficient transcriptional regulation of nuclear chromatin structure. Coregulators play a variety of roles in regulating transcription. These include the direct interaction with transcription factors, the covalent modification of histones and other proteins, and the occasional chromatin conformation alteration. Accordingly, establishing relatively quick methods for identifying proteins that interact within this network is crucial to enhancing our understanding of the underlying regulatory mechanisms. LC-MS/MS-mediated protein binding partner identification is a validated technique used to analyze protein-protein interactions. By immunoprecipitating a previously-identified member of a protein complex with an antibody (occasionally with an antibody for a tagged protein), it is possible to identify its unknown protein interactions via mass spectrometry analysis. Here, we present a method of protein preparation for the LC-MS/MS-mediated high-throughput identification of protein interactions involving nuclear cofactors and their binding partners. This method allows for a better understanding of the transcriptional regulatory mechanisms of the targeted nuclear factors. Protein-protein interactions play an important role in many biological functions. As such, these interactions have been implicated in signal transduction; protein transport across cell membranes; cell metabolism; and several nuclear processes, including DNA replication, DNA damage repair, recombination, and transcription1,2,3,4. Identifying the proteins involved in these interactions is therefore critical to advancing our understanding of these cellular processes. Immunoprecipitation (IP) is a validated technique used to analyze protein-protein interactions. In order to facilitate the identification of co-immunoprecipitated proteins, mass spectrometry is often utilized5,6,7,8,9. By targeting a known member of a protein complex with an antibody, it is possible to isolate the protein complex and to subsequently identify its unknown components via mass spectrometry analysis. ARIP4 (androgen receptor-interacting protein 4), a transcriptional coregulator, interacts with nuclear receptor proteins in order to activate or repress its target promoters in a context-dependent manner9,10. To better understand the transcriptional regulatory mechanisms governing these nuclear factors, we describe a comprehensive method to purify and identify ARIP4 interacting proteins by using the LC-MS/MS system. Seed HEK293 cells in 100-mm culture plates (2 x 106 cells/dish). Culture the cells in Dulbecco's modified Eagle's medium supplemented with 10% fetal calf serum, 100 µg/ml streptomycin, and 100 units/ml penicillin. Incubate the cells in a humidified incubator at 5% CO2 and 37 °C. The next day, transfect the cells with 10 µg of FLAG-tagged ARIP4 plasmid using 40 µl of transfection reagent according to the manufacturer's directions11. Approximately 36 hr post-transfection, wash the cells with ice-cold PBS and harvest the cells using a scraper. 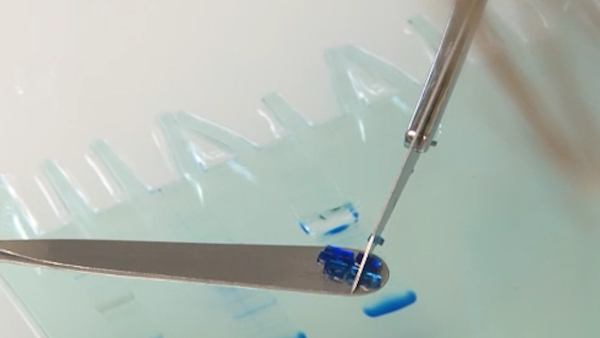 Transfer the cells into a 1.5 mltube and centrifuge it at 8,000 x g for 2 min at 4 °C. Aspirate the supernatant and resuspend the cell pellet in 5x the pellet volume of 0.4 M KCl buffer (High salt buffer: 20 mM Tris-HCl (pH 8.0), 0.4 M KCl, 5 mM MgCl2, 10% glycerol, 0.1% NP-40, 10 mM β-mercaptethanol, 1x protease inhibitor cocktail). Rotate the mixture for 20 min at 4 °C. Centrifuge the tube at 17,700 x g for 10 min at 4 °C. Transfer the supernatant (whole-cell extract) to a new 2-mL tube and add 3x the initial volume of 0 M KCl buffer (Dilution buffer: 20 mM Tris-HCl (pH 8.0), 5 mM MgCl2, 10% glycerol, 0.1% NP-40, 10 mM β-Mercaptoethanol, 1x protease inhibitor cocktail). Perform another centrifugation (17,700 x g for 10 min at 4 °C) and transfer the supernatant (whole-cell extract) to a new 2 ml tube. During the centrifugation (2.4), wash 50 µl of anti-FLAG beads with PBS, 0.1 M glycine-hydrochloride, and then 1 M Tris-hydrochloride, followed by washing twice with 0.1M KCl buffer (Low salt buffer: 20 mM Tris-HCl (pH 8.0), 0.1 M KCl, 5 mM MgCl2, 10% glycerol, 0.1% NP-40, 10 mM β-mercaptoethanol, 1x protease inhibitor cocktail). The centrifugation for this washing process is performed at 2,000 x g for 1 min at 4 °C. Mix 50 µl of FLAG beads with the whole-cell extracts and gently rotate the mixture for 4 hr at 2-4 °C (1% of the whole-cell extract from step 2.4 should also be kept at -80 °C for future use as an input). Transfer the sample to a micro spin column (gravity drop). Keep the flow-through in a 1.5 ml tube, freeze it using liquid nitrogen, and store it at -80 °C (check the protein levels of both the input and flow-through using Western blot analysis). Add 1 ml of 0.1 M KCl buffer (Low salt buffer) to wash the FLAG beads (gravity drop). Repeat step 3.4 at least four more times (for a total of five washes). Place the column into a 1.5 ml tube and centrifuge it at 2,000 x g for 1 min; the beads will dry. Cap the bottom of the column. Add 50 µl (equal to the volume of FLAG beads) of 0.1 M glycine-HCl (pH 2.5). Gently shake the mixture for 10 min at room temperature. Place the column into a new 1.5 ml tube and centrifuge it at 2,000 x g for 1 min. The eluted solution is neutralized with 10 µl of 1 M Tris-HCl (pH 8.0); mix well by pipetting or by using a vortex machine. Add 50 µl of 100 mM NH4HCO3, 10 µl of CH3CN, and 2 µl of dithiothreitol to the mixture (112 µl total volume). Incubate the sample for 30 min at 56 °C. Place the sample at room temperature for 10 min. Add 10 µl of 333 mM iodoacetamide to the sample and incubate it in the dark for 30 min at 37 °C. Add 10 µl of trypsin (33 ng/µl) to the mixture and incubate it overnight at 37 °C. Following overnight trypsinization, transport the final product to an LC-MS/MS facility or to a third-party mass spectrometry lab for analysis12. 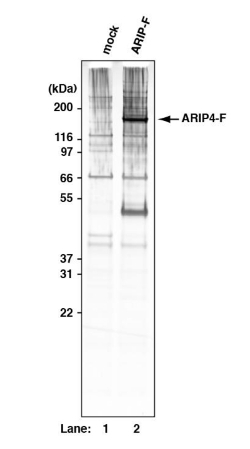 We identified a strong ARIP4 signal, around 160 KDa, as well as those of a mock sample control and several other unknown proteins (Figure 1). LC-MS/MS analysis identified both the ARIP4 complex peptides and the potential peptide cofactors within the fraction of FLAG beads (Table 1). p62 (Sequestosome1), a known ARIP4 cofactor11 was identified in the analysis (Table 1), which confirms the efficacy of this system11. We also identified many other previously-reported proteins that interact with ARIP4. In this way, Sumo210 and DryK13 were detected via the LC-MS/MS analysis. ARIP4 peptides were also identified using the LC-MS/MS analysis, which suggests that the IP was of high quality. Overall, the LC-MS/MS technique is a powerful tool that can be used to identify unknown nuclear events linked to protein-protein interactions. Full mass spectrometric results will be available upon request. Figure 1: Purification of ARIP4 Complexes. Silver staining of FLAG epitope-tagged ARIP4 (ARIP4-F) expressed in HEK293 cells and immunoprecipitation with a FLAG-specific antibody. Purified proteins were resolved using gel electrophoresis and visualized with a silver stain. As a control, a mock purification was performed on HEK293 cells that did not express exogenous proteins. Molecular weight standards are shown on the left. Please click here to view a larger version of this figure. 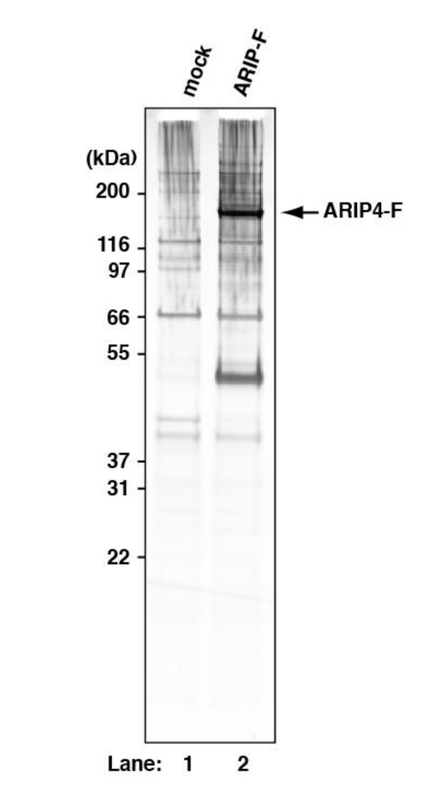 Table 1: Identification of Novel ARIP4 Binding Proteins. FLAG beads bound to purified protein complexes were dissociated by trypsin-based digestion. These proteins were subsequently identified using LC-MS/MS analysis. The LC-MS/MS data was analyzed using the Swiss-Prot database and MASCOT software. 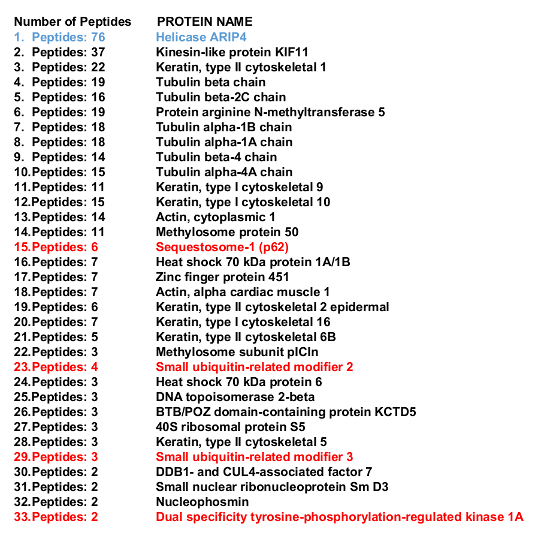 The number of peptides and the identity of these proteins are shown. Only proteins with significant MASCOT scores (p <0.05) were selected. Efficient transfection is essential to obtain a successful result with this protocol. Accordingly, we recommend using Western blot analysis to determine the immunoprecipitated FLAG-tagged protein levels. This step enables users to verify that their protein of interest is properly overexpressed and, moreover, that the IP was performed successfully. FLAG-tagged protein levels should also be checked prior to the mass spectrometry analysis. A mock sample should be used as a negative control to avoid obtaining a false positive result and to discriminate the background from true interactions. Moreover, when studying human proteins, experiments should be performed in a relatively clean environment (e.g., a clean room) to avoid contamination. Although a protein extraction buffer with a high salt concentration (0.3-0.4 M) may be occasionally used to extract nuclear proteins, an IP buffer with a 0.1-0.15 M salt concentration is most often recommended. This allows the IP procedure to proceed without disrupting protein-protein interactions. To further minimize the background signal, magnetic beads can be used for the purification process. It is also important to optimize the cell lysis conditions in order to reduce false-positive results. The significance of the method described in this study with respect to other techniques (e.g., in gel digestion-based single protein identification)5,10,11 is that it allows users to perform LC-MS/MS analysis for the high-throughput identification of protein interactions between nuclear cofactors and their binding partners. Transcriptional gene regulation is highly dependent upon the cooperation of sequence-specific DNA binding proteins. Accordingly, transcription factors often interact with a large number of co-factors to alter target gene expression. Therefore, to better understand the cellular events governing these transcriptional mechanisms, identifying transcriptional partners that promote target protein activity is paramount. Our method allows users to quickly identify putative nuclear cofactors via their transcription factor of interest and further enhances our understanding of transcriptional regulatory mechanisms. FLAG peptide may also be used instead of a 0.1 M glycine-HCl solution (pH 2.5) during the elution process. However, if this modification is employed, the pH of the buffer used to dilute the FLAG peptides should be monitored. 3x FLAG peptides should also be used to elute the proteins from the FLAG beads. Accordingly, a solution with a relatively high pH should be used to dilute the FLAG peptides under these modified conditions. It is also crucial to avoid the repeated freezing and thawing of the samples in order to maintain the proper protein-protein interactions. On occasion, the optimization of the trypsinization process may also be required for enhancing the accuracy of the results of the protein interaction screening. Although the LC-MS/MS method is a tool that can be used to identify the interactions between nuclear proteins, one of its limitations is that it does not provide exact details regarding the assembly of the protein complex. To enhance complex stability, chemical crosslinking treatments can be used14. As an alternative method, capillary electrophoresis-MS/MS is also useful15. This study was supported by the Astellas Foundation for Research on Metabolic Disorders (HT), the Takeda Science Foundation (HT), and by a Japan Society for the Promotion of Science Grants-in-Aid for Young Scientists (B) to HT. De Las Rivas, J., Fontanillo, C. Protein-protein interactions essentials: key concepts to building and analyzing interactome networks. PLoS Comput.Biol. 6, (6), e1000807 (2010). Westermarck, J., Ivaska, J., Corthals, G. L. Identification of protein interactions involved in cellular signaling. Mol.Cell.Proteomics. 12, (7), 1752-1763 (2013). MacPherson, R. E., Ramos, S. V., Vandenboom, R., Roy, B. D., Peters, S. J. Skeletal muscle PLIN proteins, ATGL and CGI-58, interactions at rest and following stimulated contraction. Am.J.Physiol.Regul.Integr.Comp.Physiol. 304, (8), 644-650 (2013). Qin, K., Dong, C., Wu, G., Lambert, N. A. Inactive-state preassembly of G(q)-coupled receptors and G(q) heterotrimers. Nat.Chem.Biol. 7, (10), 740-747 (2011). Ogawa, H., Ishiguro, K., Gaubatz, S., Livingston, D. M., Nakatani, Y. A complex with chromatin modifiers that occupies E2F- and Myc-responsive genes in G0 cells. Science. 296, (5570), 1132-1136 (2002). Shi, Y., et al. Coordinated histone modifications mediated by a CtBP co-repressor complex. Nature. 422, (6933), 735-738 (2003). Huh, K. W., DeMasi, J., Ogawa, H., Nakatani, Y., Howley, P. M., Munger, K. Association of the human papillomavirus type 16 E7 oncoprotein with the 600-kDa retinoblastoma protein-associated factor, p600. Proc.Natl.Acad.Sci.U.S.A. 102, (32), 11492-11497 (2005). Huang, B. X., Kim, H. Y. Effective identification of Akt interacting proteins by two-step chemical crosslinking, co-immunoprecipitation and mass spectrometry. PLoS One. 8, (4), 61430 (2013). ten Have, S., Boulon, S., Ahmad, Y., Lamond, A. I. Mass spectrometry-based immuno-precipitation proteomics - the user's guide. Proteomics. 11, (6), 1153-1159 (2011). Ogawa, H., Komatsu, T., Hiraoka, Y., Morohashi, K. Transcriptional Suppression by Transient Recruitment of ARIP4 to Sumoylated nuclear receptor Ad4BP/SF-1. Mol.Biol.Cell. 20, (19), 4235-4245 (2009). Tsuchiya, M., et al. Selective autophagic receptor p62 regulates the abundance of transcriptional coregulator ARIP4 during nutrient starvation. Sci.Rep. 5, 14498 (2015). Watanabe, T., Matsuo, I., Maruyama, J., Kitamoto, K., Ito, Y. Identification and characterization of an intracellular lectin, calnexin, from Aspergillus oryzae using N-glycan-conjugated beads. Biosci.Biotechnol.Biochem. 71, (11), 2688-2696 (2007). Sitz, J. H., Tigges, M., Baumgartel, K., Khaspekov, L. G., Lutz, B. Dyrk1A potentiates steroid hormone-induced transcription via the chromatin remodeling factor Arip4. Mol.Cell.Biol. 24, (13), 5821-5834 (2004). Mohammed, H., Taylor, C., Brown, G. D., Papachristou, E. K., Carroll, J. S., D'Santos, C. S. Rapid immunoprecipitation mass spectrometry of endogenous proteins (RIME) for analysis of chromatin complexes. Nat.Protoc. 11, (2), 316-326 (2016). Fonslow, B. R., Yates, J. R. Capillary electrophoresis applied to proteomic analysis. J.Sep.Sci. 32, (8), 1175-1188 (2009).